Financial donations to the Victoria Shambhala Centre support all we offer, helping us make enlightened society possible in Victoria and beyond. We gratefully accept any donation, big or small, made in any way. All donations are tax-deductible. To donate via PayPal—a secure and widely used online payment system that accepts major credit cards—please complete the Donation Form below. 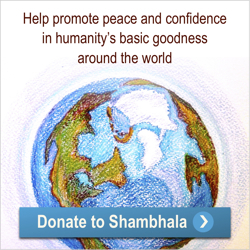 For assistance please contact Barbara Campbell, Financial Representative, at finance@victoria.shambhala.org. Please enter the amount ($) you would like to donate. You may specify the purpose of your donation and enter any additional notes here.